Meet 11-year-old Isaiah Rocha Morales. He sounds pretty typical for a kid his age. “Everything’s boring here. There’s not a lot to do. Almost no one goes to the park to play,” says the sixth-grader at Pleasant View Elementary School in Poplar, a tiny Latino farmworker town of about 2,500 people in Tulare County. Isaiah’s teacher, Somphane Hunter, describes his behavior as difficult, sometimes challenging. But Isaiah’s getting more focused these days, thanks to an unexpected outcome of the California drought. The water shortage in his community has inspired a group of young activists to knock on doors to register voters. In the June primary, fewer than 100 voters in Poplar cast ballots. In the first political campaign of Isaiah’s life, he’s already managed to register his parents and three other people. Poplar doesn’t have a mayor or a city council. 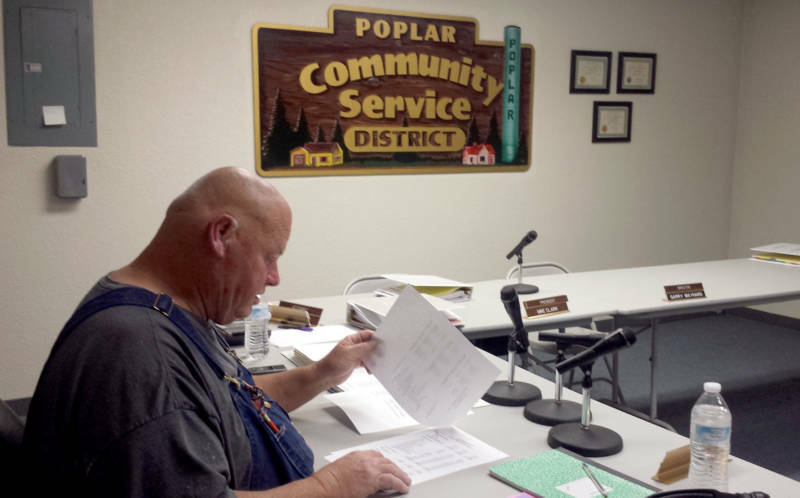 The only local elected officials are the five members of the board of the Poplar Community Services District, which manages water, sewage and the community’s one park. Now there are two open seats on that board. And activists like Isaiah hope to fill them with someone who can help Poplar residents with a basic necessity: drinking water. The town has three water wells. Water levels for two of those wells have been steadily falling with the drought. The other one is polluted with nitrates, colorless odorless contaminants linked to fertilizer use. Nitrates in drinking water can cause problems for pregnant women, and have been linked to cancer in some studies. Current board vice president Garry Maynard says Poplar’s drinking water is safe to drink, and qualified water experts test it every month. 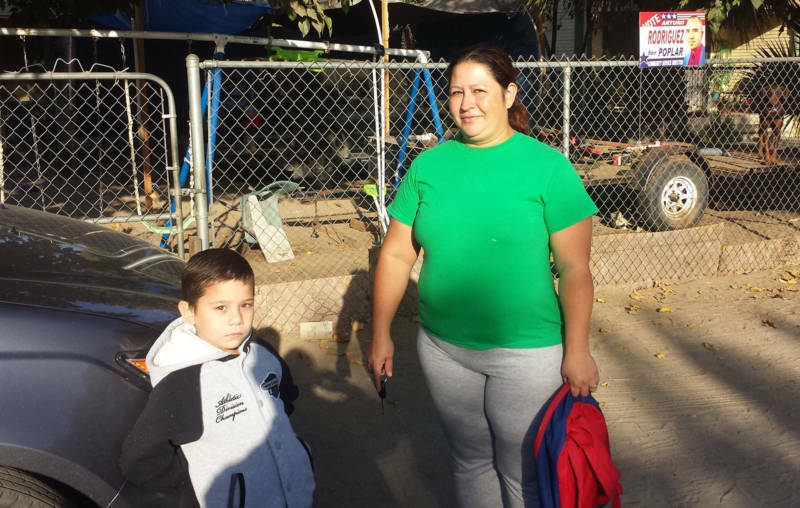 But many Poplar residents, like Evelyn Rodriguez, aren’t confident it’s safe. “We don’t drink it. We only use it to take showers and sometimes we use it to cook,” says Rodriguez, who has a young son. Boiling nitrates, by the way, doesn’t get rid of them. Her neighbor, Arturo Rodriguez (no relation) has questions about the water, too. Questions that were sparked when he attended a water board meeting four months ago. “I remember a woman from a state water agency questioning the board members about the fate of $312,000 allocated many months ago to drill a test well. Seems they didn’t do anything with the money,” says Rodriguez. He and his brother are among the four candidates who want to fill the two vacancies on the board. “From what I know, it’s the first time this board has been on the ballot,” he says. Current board member Maynard says the problem is that Poplar residents lack interest in local affairs. Maynard himself was appointed by the Tulare County Board of Supervisors, and has served on and off for some 20 years. But residents I talked to said they didn’t remember receiving information about any open seats on the board, or the activities of the water board in general. Two months ago, dates for upcoming meetings did start to appear on water bills, but only in English — in a town that is mostly Spanish-speaking. I went to the tiny water board office to ask why. Connie Mendiola is the secretary. She showed me a water bill with the date for the next meeting. “Board meeting September the 1st. This is in everybody’s bill. Everybody received a bill here, so they can see what’s going on,” she explained. “I didn’t know that we have to go bilingual,” said Mendiola. “We don’t,” chimed in Maynard. This kind of insensitivity to the Latino community is one of the reasons 11-year-old Isaiah is motivated to register his neighbors. He deeply values the hard work his parents and others endure in the fields. “We Latinos, our parents go to the fields, and they work like donkeys. And some die in the heat,” he says. Isaiah says that he hopes by the time he gets to vote, Poplar and other communities like his will have a better future, one in which there’s room at the decision-making table for everyone. Ruben Tapia originally produced this story in Spanish for Edicion Semanaria, the weekly show from Radio Bilingue.